OSWEGO, NY – Lizzie Borden (Rachael Leotta) is chastised by her father Andrew (Stephen Mahan) as her step-mother Abby (Gabbi Castiglia) looks on as the Oswego High School Drama Club prepares for this weekend. 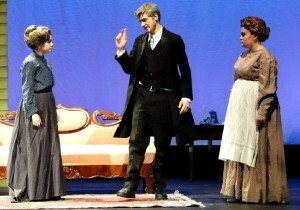 “Lizzie Borden Took an Axe” will be presented at the Robinson-Faust Theatre for the Performing Arts at Oswego High School on Friday and Saturday at 7:30 p.m. Please contact the box office at 341-2270 with any questions.